Who says you cannot judge a book by it's cover? Nobody wants to be reminded that their vehicle has been in an accident. That is why our custom auto paint shop uses state-of-the-art auto painting systems to make Puyallup, WA vehicles look like-new again. Let our auto paint shop fix chipped paint on your Puyallup vehicle before it ends up causing moisture-related damage, which can be very expensive to fix. Our auto paint shop can keep the paint repair costs to a minimum, and your vehicle looking shiny and new. Automotive accidents happen. No matter how big or small the vehicle damage, you will most likely require a car painting service in Puyallup. With our car painting service, you can get your Puyallup vehicle back to pre-collision condition, especially after the repair work of the vehicle has been complete. We take custom auto painting very seriously. 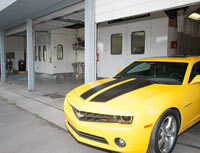 We also provide a complementary hand detailing to your entire vehicle after the custom auto painting job is complete. Our goal is to achieve complete customer satisfaction, and we have earned a solid reputation for providing reliable, high-quality auto painting work in the Puyallup area. Call Lakewood Auto Body at 253-581-0220 to schedule a car painting service appointment for your Puyallup vehicle.